It’s snowing like a dog here in Woodyboaterville, so I thought why not post a huge story. Here it is from Howard Johnson Jr of Old Time World. 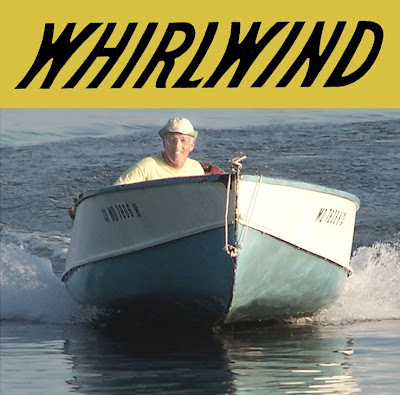 More than anyone ever wanted to know about Whirlwind boats. Unless you have one… Happy reading. stay warm. Only 24 days til Lake Dora… Wohooo.. It is November of 1945 and the war is over. The United States Navy decides it no longer wants the molded plywood glider airplanes, being made on the assembly line at Allied Aviation, in Dundalk, MD. The management and workers stand, looking at the five finished and tested ones they had made and the fifteen more along the way. No further money will be available for operations, now; not even severance pay or rent on the big building. 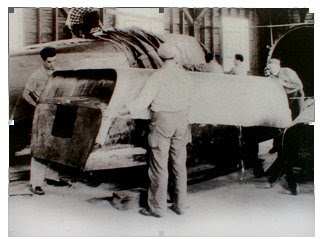 They decide to put the gliders aside and to build boats, using the veneer, glue and baking oven from the molding operation of the wooden airplanes. First they would have to move everything, at their own expense, to a new and cheaper workplace. A rented commercial building in Cockeysville Maryland, near Williamson Veneer Company is where they settled. As soon as they could, they built a solid wood hull shape called a mandrel, on wheels. Whirlwind Construction; The layers of the mandrel are roughed in, ready for shaping. Some 40 different ones were created, one for every hull style and size, they were all on wheels. Five layers of veneer coated with heat actuated resorsinol glue made up each hull. They fashioned a slot for the center keel and stem. To this, were stapled the edge of each layer of veneer. This was made of thin layers of mahogany, which had been coated with heat actuated glue. The layers were put on at a sharp angles to each other so that the grain could give maximum strength in both directions. Outside layers were coated with glue on one side, all the others, both sides. They were carefully trimmed and fitted together by ladies that were wives and mothers of other employees.After five layers, it was covered with a heavy rubber vacuum blanket with hoses running to a big vacuum pump. 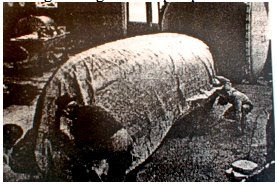 A heavy rubber vacuum bag was sealed around each hull before it was wheeled into the autoclave. The whole affair was then rolled into the autoclave, a huge oven, and baked at high pressure and steam, for an hour at 375°. Really baked! Two at a time, hulls were baked at 375 degrees for an hour with 150 lbs vacuum. A hull is pried off the mandrel while still hot. Notice that the building was not insulated. Once out,cooled, and uncovered, the fresh hull was pried off the mandrel, sanded, assembled and finished into a complete boat with transom, rubrails, seats and all features; then finished with varnish, with only the bottom painted a bright color. After a few boats, in 1946, the owner of Allied decided that he wanted to stay in aviation and offered the operation to 3 of his employees, Ed Hewitt, Charley Abramo, and Charley Wingo. All three had appreciated and enjoyed boats and worked closely together with great cooperation on gliders and were also good friends, so it was clear that they would be fully devoted to making a success of the new operation, Molded Products,Inc. While building the gliders during the War, they had gotten to know the Williamson Veneer family. Their cooperation and fine quality sawn veneers made an extremely uniform and beautiful product. Most of the veneer they made was for furniture production, so the family took a special interest in the quality of the molding veneers supplied to the now, Molded Products Inc. of Cockeysville, Md. When the Williamson’s found out that yet another place to work would have to be found, they offered an unused dairy barn on a farm they owned. Many months of sweat were shed turning that barn into a small boat factory. When Ed and the 2 Charleys found out that the Red Cross needed lifesaving canoes, they decided to build canoes. These were dazzling beautiful wood and light as a feather, yet ridgid and extremely durable. They then offered the Air Force a boat to test. They dropped the test boat out of a plane onto land where it bounced high in the air and was still good. They won the contract! This led to the building of a 35 sailboat fleet for the Naval Academy. Early pictures of the factory have these boats on the floor. long term members of the same community and now in retirement.The three founders, Ed Hewitt, Charley Wingo, and Charles Abramo each provided guidance for the different aspects of boat construction. Ed Hewitt was a CPA and office manager and made the advertisements. Charley Wingo did a lot of the design and drawing work, set up the shop and made constant production improvements; Charley was a perfectionist, they said. They all often worked all weekend. Charley was a personable, natural high energy guy that enjoyed smoking as well as racing activities. Everybody smoked cigarettes back then, It gave them an excited, bullet proof, -hard driving attitude. Charley and brother Lou took the boats and motors and raced and set records. Charley wingo’s Racing Whirlwind won three major races. They made and offered for sale a cut down model of the winning racer. Following aircraft construction methods, all hulls were minimum thickness and all structural members glued, providing stiffness and ridigity, without extra weight. Charley Wingo and Charles Abramo slaved over the drawing boards together to come up with each new design. Many shapes, sizes and interior layouts were tried to offer something for everyone and to achieve eye pleasing styles. Early models were graceful and widely varied. In 1958, hulls were more roomy with increasing flare to the bows. Boats were leak and rattle free while being light, colorful and well finished. In the beginning, attractive aluminium fittings were bought from the Baltimore foundry of H.H. Whiting Co. Later brass and then chrome plated brass was used. Charley Abramo was responsible for picking the finest cuts of mahogany planks at the lumberyard in Philadelphia. He was a stickler for high quality and the company put aside their best knot free, straight grain wood, for him.The sleek designs and high quality materials made them appealing to lovers of performance boats, all across the country.The rounded chine assured that full speed turns could always be made without sliding or loosing control. These features made Whirlwind Boats the lightest, fastest and most beautiful on the water, to this very day. In 1999, Bob Orgain and Whirlwind World put on a special Whirlwind Commemorative Event at the ACBS Antique and Classic Boat Show, in St Michaels, Md., with 13 boats on display. Founders of Whirlwind receive outstanding achievement awards. 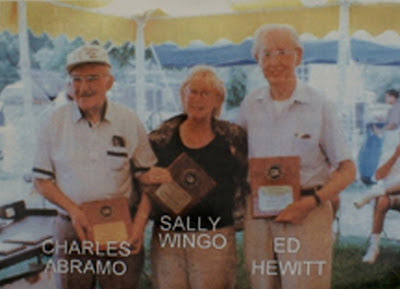 Bob gave Ed Hewitt, Charley Abramo and Sally Wingo, Meritorious Achievement Awards right after the Whirlwind Lecture. These awards and the Chesapeake Bay Magazine article on Whirlwinds were on display at the funerals of both lifelong friends who died at 92, in 2008. The wonderful qualities of the 15,000 boats they produced in the 15 years they built them, assured that many still remain and are treasured by their owners. This remarkable achievement will remain a lasting tribute to these men, their families and wooden boat building in Maryland. My Dinner With Dave Kinney. A Hagerty Classic Boat Price Guide Conversation. Life After Death For Your Classic Cruiser! Thank goodness for wood technology. Ever more important as the resouce grows ever more scarce. Thanks Woodyboater, for republishing OutBoard Man’s splendid history. I have seen this in Xerox form and other places. Howard is a good pal and wants to get the word out on these great boats. There are very few places online to get this sort of stuff. Can anyone tell me anything about a Whirlwind model 6994 14' boat? Such as what it is supposed to look like? What size engine it would/should have etc. 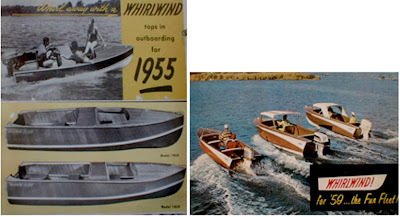 This is a great article on the unusual history of the Whirlwind boats. I own a 14" Whirlwind and it is a very solid and fun boat to cruise around in. Can anyone tell me if reproduction Whirlwind emblems are available? I just stumbled onto this article through my sons research efforts. I own a 1960 17ft. My wife noticed it in the middle of a corn field near Crisfield, Maryland. My wife happens to be a Wingo. Her father, my loving Father-in-law Bill Wingo, was Charlie Wingo's brother. Louie Wingo (Mentioned in the article) was a very close Uncle as well. I feel proud to have known them all. I knew Charlie the least. We (my wife, sons and daughter) have many found memories and souvenirs of boat racing stories, pictures and news articles past down. I hope to have my Whirlwind restored in a year or two. My Father-in-law built wooden boats as well. The company name was PriWing (named after the owners Prince and Wingo). My son has a PriWing that he is restoring so we have one of each to cherish in the family. built in 1956, given to him by his grandfather, my father Louie (Flippin' Louie) Wingo. We're slowly restoring it. My father raced these boats as well as help build them with his two brothers, Charley and Billy. I have wonderful pictures,stories & racing trophy's that my father shared with me prior to his death in 07'. Well, we have a family reunion going on here. If you click on the search this blog button on the right, it will take you to all the stories on Whirlwinds. They are fantastic little..sometimes big… boats. my daddy has a nice little whirlwind that were trying to get restored!!!! My name is Bob Gartside and I live in Baltimore Maryland.I,am almost 60 now, and when I was a youngen my Father took me to the Whirlwind factory in Cockeysville.I still remember the boats being rapped and formed.He got me a used 15' whirlwind in 1966.All I have left of it is the transom plate.I had alot of fun on her in the Chesapeake.I still have the 25 Horse Elgin that powered her in my basement.I get bring myself to get rid of her.Both me and my Father loved the bay, and that old whirlwind I'd give anything to bring her back. Hello, my name is Bobby Gartside.My Dad took me to the Whirlwind Factory in Cockeysville when I was a little kid.Now I will be 60.I remember them forming and molding the hulls.He got me a used Whirlwind in 1966 when I was 16.We told that little 15' everywhere in the Chesapeake.All I have left of her is the transom data plate and the 25 horse elgin that powered her.I wish I had her back.Alot of good memories of me and my Father on that boat !!!!!! I went to work at whirlwind in 1954, that's me on the left in the pictures of pulling the mandrel out of the oven and also in the next picture removing the hull from the mold. The website sure brings back some memories. I may have built some of the boats you guys have, I could build two of the open std. models per day or one fully decked delux model. BTW I will be 75 in a couple of mo. My family had a 21 foot cabin Whirlwind that I believe was a 1961. We spent many a night on it and I remember my dad and I building an enclosure for the head inside the cabin. I have pictures of him launching it in Middle River,Maryland. I have been trying to find old catalogs or sales brochure pictures of that model without success. I never hear anyone speak of the larger cabin models, only the small runabouts.Anyone that can relate to this, I would appreciate a response. The 21′ cabin cruiser was called a Jupiter. I think that was the largest boat they built. I own a 1957 16' my dad bought new. We went to the factory and met Ed Hewitt, who 'found' us one at a dealer in Hyattsville. Got its second refinish a couple years ago. Still leak-free, and always gets comments just as it did when new. ("It looks just like a piece of furniture"). If you guys can keep a secret…. My grandfather is Martin Prince from Priwing, we were cleaning out the garage one weekend to work on a project I have going on and Pop as we call my grandfather found his old templates and blueprints for the Priwing. I have asked and he has said he had one more left in him so I cant wait till we finish it. Just wanted to share with you guys! ALex, did the priwing ever get built? What about the blue prints? I have a 1957 16 ft. deluxe runabout that I bought as a leftover from a dealer in Carteret N.J. back in 1965. I've never had it in fresh water and used it every year since I owned it. Many trips to Statue Of Liberty, Sandy Hook and local Ny NJ waterways. With a 1957 Evinrude 35 hp. it would do 35 mph with me in it at 180 lbs. Still looks beautiful and classy. Hey all, I'm new to the scene. I was just searching google for Whirlwind info and ended up sending a couple emails back and forth with a guy (Matt)that told me to check out this site as the Whirlwind site is still in progress. I'm not much of a wooden boat restorer but I will be soon. My mothers father had grown up and lived on the bay his whole life (god rest his soul) and had purchased an 18' in '60 I think. I remember taking trips to Heart Miller island for cookouts and eating crabs and floating around for hours. I liked the days when we had so many family members that wanted to party that we would have to take two trips. Drop some off and then head right back to the house to pick up another crew. "Pop-Pop" would let me drive on the way back, being 6 or 7yrs old, it was totaly awesome. He'd even let me crank the wheel lock to lock at a pretty good speed and lay it on its side. Ahhhh, those were the days. So any way, my grandfather has moved on to greener pastures and left the boat to my father. It sat for a few years and then was "Professionally" re-finished in Essex. Had a new top and cusions made, re painted, the whole nine. Man was it awesome!! My dad is more of an off shore fisher man then a classic boat driver-guy (lol). He didn't really like the bottom of the Whirlwind, "it'll beat you to death" he'd say. So it's been sitting for a couple years. He's even been trying to sell it. You may have seen it on the right side of Rt50 after the bridge and the outlets on the way to Ocean City MD. After being there for sale for almost 5yrs he sold the new motor and controls and almost sold the trailor once. One guy stopped a long time ago to check it out but wasn't interested in buying. My dad asked me if I was interested in it. I said sure for the right price ahhah. He said just give me enough for the trailor which was the only thing that was new. I did and now I'm the proud owner of a 1960-1? 18' peice of family history. I've suckered my brother in law into helping with restoring here and there. We're headed to Chincoteague Island this weekend to take care of what ever we can. Sorry for my life story but I have a feeling we're going to need some guidance in our quest for beauty!!! Stay tuned, I'll try and get some pics up if I kind find where to stick 'em. I’ve owned a 1957 16 ft.deluxe runabout since 1964. I was lucky to buy a leftover from a dealer in Cateret NJ. The boat was kept under an overhanging roof outside for7 years.The original finish was either satin varnish or it was faded from being kept outside. After cleaning, I installed all the necessary running gear: 35 hp evinrude,steering wheel, cable,running lights ect. Since then I’ve used it every year to date.My wife and my 3 children enjoyed the boat till they were married. What a wonderful experience with a wonderful boat. Thanks……. I was interested in the letter from Martin Prince’s grandson. I grew up in Sherwood Forest where there were 3 Priwings. Two 12 footers and one 14. The 12’s had 45 hp and 50 hp Mercs and would do a tad over 50. The 14, I think, had a 50 on it also, but the boys got a bit inventive one year and rigged a second 50 on it. Not sure how it ran with the 2 50’s, but am sure it was interesting. They were fabulous little boats! The 14 has been redone but I believe the two 12’s are long gone. Would love to see some old pics if anyone has any. My Name is Alex and im Martin’s grandson. I asked pop if he had any old Priwing photos and as of yet he hasnt found any. However he did find a price list from 1956 I believe, actually a whole pile of them. As soon as I can I am going to scan one and post for you guys. I am glad someone saw my post….. So far on my 14 footer it has a hull and am searching for decent wood for the gunnels and decking. I cant wait to tow it behind my 64 F100 and take her out! Thanks, Alex. One thing that I forgot to mention is that what I believe was the prototype for the 12 footer was sold to a friend of mine who lived on the Severn. That boat was raced by either your grandfather or his partner and was named BUM LUK. It existed until about 1969 when we hit some cruiser wakes and the bottom separated…….it was later relegated to the burn pile on Joyce Lane. Best of luck on your project…would love to see it. I just bought a 1956 Whirlwind this afternoon. I think it is 12 or 13 feet..great condition. 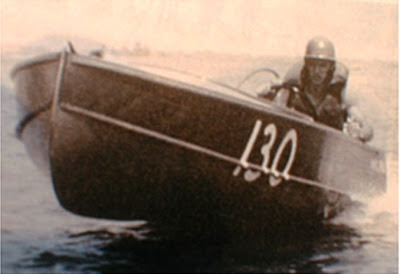 18 hpr originial Evinrude. parts etc. would be welcomed. Thank you! I have inherited a 57 Whirlwind that has been partially stripped and is ready for a resoration. Any suggestions on a baot yard on the East Coast who would like to look at my family treasure? Coach Glenn – Thanks for commenting on Woody Boater. We are hoping to do an updated Whirlwind story on Woody Boater right after we return from the Sunnyland Show in Florida. When we do the new story, we will include your question on possible East Coast boat yards, as well as (hopefully) Priscilla’s new Whirlwind and try to get some fresh responses. If you have any photos or information on your ’57 Whirlwind e-mail them to us at [email protected] and we will include them in the new story. About 5 years ago my husband inherited a 1960? 21 foot inboard Whirlwind. We’ve been slowly working on it ourselves and she runs well but needs some hull work that is a bit beyond our capabilities. So, we too are looking for suggestions on an East Coast (preferably close to DC) boat yard. I have been fortunate enough to aquire a 18ft Whirwind Mars Cruisette in good condition found under a tarp in a shed in Jackfish Lake Alberta Canada. The boat has been restored with West System Epoxy below the water line and varnish above the waterline and fitted with a 50 HP Yamaha. It is my favourite boat for flat water, weighs only 300 lbs, and is still tough after 60 years. James – Thanks for tuning in to Woody Boater. We would love to hear more about your recent Whirlwind boat discovery and see any photos if you have any. I had a Whirlwind years ago back in the 1960s. I got it used for about $100.00. It had been stored inverted and covered and only needed cleaning,a light sanding and good varnish and bottom paint. I removed and polished all the hardware and got it back on later. What a classy little yacht. In Great South Bay with a cherry 5 1/2 hp. Johnson and skinny me with one fishing rod it would actually plane.It was lighter than air it seemed and seemed to draw about an inch of water,at most. When I moved out here I sold it to Webers Fishing Station in Babylon. I hope it was coddled. I had a 15′ boat with a tug boat superstructer, I think it was built by Whirlwind in the ’50s. Is that possible? It was so cool, but it would tip over in a heart beat as you had to stand up to drive it. 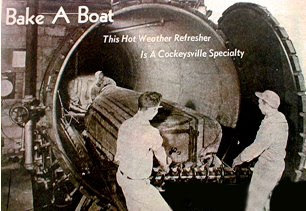 My father owned 6 16′ mahogany plywood canoes made by this company in about ’47 or ’48. He ran canoe trips for his high school swimmers for many years. one broke up in some rapids along the Minnesota-Ontario border; he sold 4 to the Boy Scouts [and bought indestructible Grummans!] and the last hangs in my boathouse in Cedarville, MI. great little craft. still fun to paddle. Just bought a 1956 Whirlwind and starting to restore it. I’m excited and will post pics soon. My Grandfather, Grandmother, and Father worked at the Factory. I have an original 1957 Whirlwind boat my Grandfather made for us. I love it very much. Someday, I will try and share more of my stories. We completed restoration of Whirlwind 13073, a 1959 14-footer in the summer of 2016. It had been stored in a barn by its original owner from the mid-70’s until we bought it in 2015, so it was in great condition structurally. Lots of stripping, sanding, staining, and varnishing later, she turned out beautifully. Replication Whirlwind emblems we had professionally rendered were the final touch. We added a restored 1958 Johnson 35 hp Seahorse motor and now enjoy taking our fantastic little boat to the lake every chance we can. She turns heads wherever we go, whether on the water or on the road. A tip of the hat to Howard Johnson of Old Town World, who was a great and patient mentor throughout our project. Pictures of our restoration are proudly displayed on his website. Thanks again, Howard.